One of my favourite things is sitting down to read. Like many people it's a way to escape but also for me it is one of the best ways to learn and discover more. Taking the time to savour the sculpted journey created by an author's words, absorbing the content, and enjoying the main message from cover to cover is one of my simple pleasures. I fit in reading a book where I can, whether its my 15 minutes during my commute to work on the train or snuggling into a blanket with a cup of chai tea in hand at the end of a busy day at work. I enjoy the moment and I'm trying to make more time for it, especially at weekends. Over the past year or two I've rediscovered my love of books, last March I wrote a blog post about a few of the books I have been reading and some of them crop up here too. For me at the moment I'm especially loving the raft of personal development and creativity books that I'm finding. I haven't read a novel for quite some time, I love them but I know in time that they will be there waiting for me when I'm in the mood. For now it's all about reading about and discovering more about creativity, development and making changes to life. My Heart Wanders by Pia Jane Pijkerk I return to this book time and time again when I feel I'm on the cusp of change. The book is about Pia's life, the poignant moments and changes through her life so far. It's a book about 'a celebration of taking risks, letting go, and making a home wherever you are'. Many of her words about her journey resonated with me, about travel, relationships, preparing to go away from home or move home and deciding what to take, and a feeling that something got lost in the past. Pia's words and journey about getting lost and having to retrace her steps would resonate with anyone who has decided to take a new route. It's a delicious book packed with gorgeous photography and beautifully crafted words that bring comfort and closeness. Creative Thursday by Marisa Anne A simple and delightful book about "everyday inspiration to grow your creative practice". I adored this book with its mix of advice and approaches straight from Marisa's heart. Her authentic words and thoughts on her creative practice are surrounded by her beautiful illustrations and the book feels like an easy and pleasurable read. When you delve in you'll find a wonderfully paced book, with a playful balance of words, photos and illustrations that enables contemplation. The Artists Way by Julia Cameron A book doing just what the cover says 'a course in discovering and recovering your creative self'. It's a book that, if you start reading more about creativity, is quoted everywhere. I had this book on my bookshelf for quite a while before taking the time to try it. Rather than working through the book one chapter per week I decided to read it cover to cover to get a feel for what it is all about. For me it took a real push to get through the first few chapters, however I grew to love this book with its simple approach and weekly break down. I think it sparked a few thoughts that took me down a different route, and rather than do the course, I wanted to keep reading. I will return to this book when I want a course in boosting my creativity. The 7 Habits of Highly Effective People by Stephen Covey It is a classic and popular book first published in 1988. Despite its typical motivational book cover design and initial feel I decided to get past this and really got stuck into the content. It is an engaging read and one that needs concentration and time to digest. For me it will be a book I return to in time to re-read throughout my life and become even better acquainted with the habits that are covered. I read it cover to cover and felt a real sense of satisfaction and insight. The model of the 7 Habits that Stephen presents is really insightful and 'begin with the end in mind' is one habit that keeps coming back to me at the moment. Better than Before by Gretchin Rubin The book is a follow on book from Gretchen's other books The Happiness Project, being the one book I have read previously. It's a book based on Gretchen's personal insight into how understanding your habits will enable you to make change. Her personal connections to the discoveries, the explanation of how people have expectations that can be grouped into four tendencies, and the pillars of habits were insightful. I feel that this book deserves a follow up read at some point this year for me. Thrive by Arianna Huffington This book was one of the first books of last year that I decided to read. Arianna describes her life changing moment that made her take a different view on life and how she has decided to live it. It's a book that is full of research and statistics from a wide range of scientific studies all brought together under the notion of how to make change in your life and make it more fulfilling, with a focus on personal wellbeing and happiness. 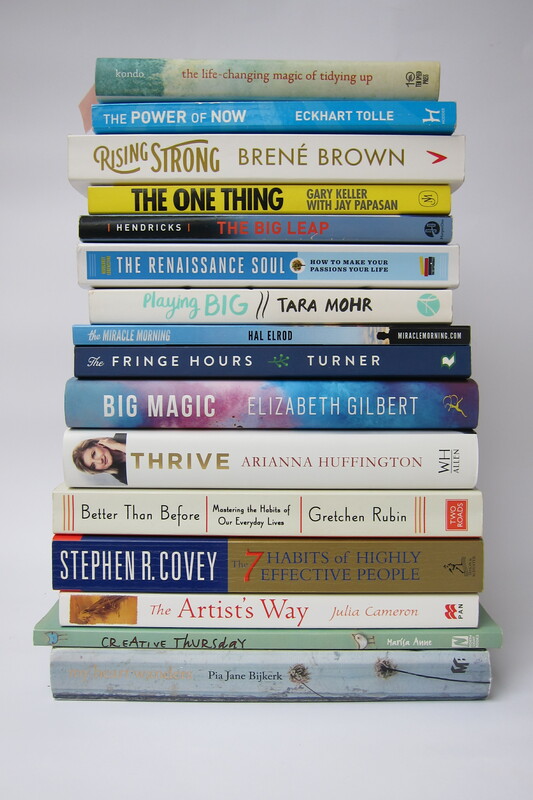 Big Magic by Elizabeth Gilbert I started by writing 'an incredible book', but that isn't particularly helpful. The deliciously colourful hardback book jacket and the ease of reading this book, meant that I devoured this book over a few sittings. The chatty writing style, honest insights, flowing content is packed with personal experience and for me was a delight to read. The book is one that I will return to and is a book that makes you feel that Elizabeth is there with you telling her story about her creativity and her 'Big Magic' moments. The Fringe Hours by Jessica N Turner I adored this book and wrote about it in detail last year in a blog post. The Fringe Hours is about how to find time in the day to do things that you love and how we should aim to focus more time on self-care. Based on research from over 2000 surveys completed by women, the book brings together a collection of ideas, thoughts and quotes from women detailing how they feel about needing time for themselves and how they are using their fringe hours. I adored this book and it made me more aware of pockets of time that I can use in my day, but also highlighted to me what I was already doing in my fringe hours that I had set aside already. The Miracle Morning by Hal Elrod Following listening to a podcast about Hal and his story I decided to buy this book. Hal is someone who is full of energy and really inspiring. The Miracle Morning is a short and easily digestible read, starting with how Hal's life changing moment and personal story became a catalyst for change in his life. The concept of the 'miracle morning' and his S.A.V.E.R.S ideas for a morning routine are insightful. I have not yet been totally converted to everyday having a new morning routine but I'm making time to appreciate the different elements of the S.A.V.E.R.S that Hal covers in his book. Playing Big by Tara Mohr This book follows on from Tara's step by step leadership programme for women. Playing Big is an in-depth look at how to become more empowered as a woman and how to make changes to be more bold, self confident and 'play big'. The book contains journaling questions at the end of each chapter and helpful chapter summaries making it an approachable read. For me I would like to read this again this year to see what other thoughts I can take from it to help me play big. The Renaissance Soul - How to make your passions your life by Margaret Lobenstine It's heart warming to discover a book that you wish you had found a while ago! For me this book went in a direction than I hadn't expected, at last it felt ok to be someone who has multiple interests and passions. This book is packed full of information about how you can thrive on many interests and not feel overwhelmed. Working through a discovery of your own values and practical exercises within the chapters provides a confidence that you can build a life encompassing all your passions. This is another book that I will be dipping back in to later this year. The Big Leap by Gay Hendricks An easy and simple book to read that focuses on how to move beyond a problem that is holding you back from achieving your true potential. In The Big Leap the concept of 'upper limit problem' is discussed as well as moving from a zone of excellence to the zone of genius. It's a book about understanding the personal and hidden barriers we create that stop ourselves from moving forwards. It's a short read but one that provides a different viewpoint on how to move past barriers and move forwards. The One Thing by Gary Keller with Jay Papasan This book is one of my favourite books of the past year and I have read it twice and each time found more information and advice that spoke to me. The key statement in the book is to you ask yourself "what's the one thing that I can do such that by doing it everything else will be easier or unnecessary?". The book encourages you to ask yourself this question across the areas of your life that matter the most to you, for example, work, relationships, health, spirituality, and personal life. It's a book about having a focus on the one thing that you are hoping to achieve, how to work from that thought and how to go about taking small steps to achieve it. There are illustrations throughout the book that help put some of the key concepts into a visual form. I enjoyed reading this book and have littered it with post-it-note tabs highlighting the most insightful key points for me. Rising Strong by Brene Brown A book that forms part of Brene's book series that deal with tough subjects, this time it is about fear and failure and how to build a courageous life. It's a book built upon Brene's academic research and her own personal reflections on situations she has had that highlight the key themes discussed in the book. Brene's style is authentic and she is open and brave to put her struggles and thoughts into a book. I found Rising Strong a deeply impactful book which connected to my feelings and experiences across many levels. As the book cover says 'if we are brave enough, often enough, we will fall. This book is about getting back up'. Brene's writing style is engaging and I really enjoyed this book, it has made me want to buy the other two books that she has written that have been hovering on my wishlist for a few years. The Power of Now by Eckhart Tolle I've had this on my bookshelf for about five years and it took until the end of last year to read it. I had tried to read this book previously but just couldn't connect with the subject. It is a book that for me I would now recommend to others but is a book that for me required quite a lot of concentration and focus to really understand the meaning behind the words and way that the book was structured. I felt I have taken something away from this book but can't quite put it into words at the moment. It's about being present in the current moment and how that can enable you to have a happier and healthier life. It is a short read but one that requires quiet contemplation more than any other book I have read. The Life Changing Magic of Tidying Up by Marie Kondo This book is now appearing everywhere I look. I read this book early last year and wrote about it in a blog post. I will openly admit that I have yet to do the full Marie Kondo method of tidying on our home. I have worked through some sets of things in my life, such as some clothes, paperwork and excess belongings that were still in boxes but I haven't quite had the desire to go full blown Marie Kondo on our home. Inside the book Marie writes about the in-depth approaches to tidying and working through clutter, approaching it by category instead of location. The main premise of the book is to hold an item in your hands and see if it "sparks joy" and "speaks to your heart". I think this will be a book that I return to. Many of the ideas about simplifying have stuck in me at the purchasing stage of an item, does this spark joy, if not then I don't buy it. There you have it, my top 16 books for 2016. I hope these mini insights into these books provides you with a few new non-fiction reads for your 2016 reading list. For me summarising these books has made me want to read them all again and to go back through the exciting journey of each book. I have a list of other books that I plan to start dipping into this year and will let you know how I get on.